To most of us, Eunice Stapley is as much a part of the curling club as the ice, the rocks, or the self-serve bar (OK, it’s not exactly “self-serve”… more on that later). Last month, Eunice retired as Manager of the Campbellford & District Curling and Racquet Club and she has successfully “passed the broom” to long-time member Rachel Whitton. 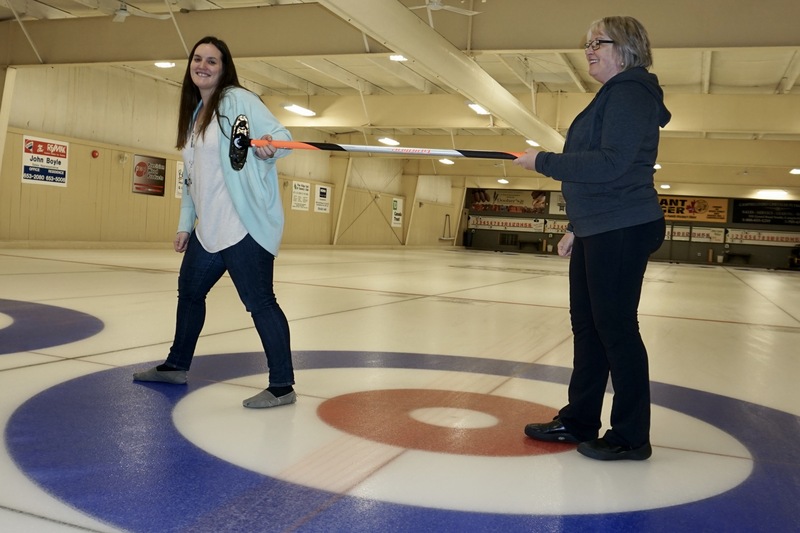 Rachel—a graduate of the Algonquin College Hotel & Restaurant Management program—has been curling at the club since she was in grade 7 and is a natural to succeed Eunice as the club manager. Of course, there is much more to manage than just curling (fitness facilities/classes, a thriving squash league, weddings and other event rentals) and Rachel is grateful that Eunice is still around to help with the transition. Eunice, and her husband Ed, will continue to be active members and volunteers. That’s how they were first introduced to the club back in the ‘80s when Eunice helped out with a home décor show called “A Touch of Country” that was run by Elsie Search, Jean Michael, Wendy Mahoney and others. Shortly thereafter, she and Ed took up squash and curling, and the pair have been fixtures at the club ever since. When my family moved to this area six years ago, a top priority (after assessing schools for my kids, of course) was to find a local curling club to call home. As with most prospective members, Eunice was my first impression at the Campbellford club. As she guided me on a tour of the diverse amenities, I learned that Trent Hills’ only dedicated curling facility first opened its doors in November 1981 with four curling sheets and two racquet courts. In 1986, it was expanded to include the gym, sauna, steam room and more courts. Eunice’s friendly, thorough, no-nonsense presentation had me sold right away. Of course, nothing helps a sales pitch like a low price and great value. Today’s annual fee of $398 including tax still seems like a great deal to me. And all I do is curl there. Others—like my brother-in-law Mike (who obviously has more spare time than me)—curl, play squash, and hit the gym on a regular basis. There are classes for kettle bells, yoga, spin and general fitness, and it’s all included in one membership price (cut that in half if you’re a student!). The facility is open from 4:30am to 1am, 7 days a week, so there is no shortage of opportunity to get your atria pumping. Campbellford’s club is supported and subsidized by the priceless contribution of many hands, whether it be home-cooked meals at bonspiels, repairs and renovations, or fundraising for major expenses like the new outdoor condenser for the ice plant that had to be purchased this summer for over $30,000. The curling, squash and fitness members are the heart and soul of this club, and the countless volunteer hours have everything to do with the absurdly reasonable membership dues. The aforementioned “self-serve bar” is a great example. Many members have taken personal time to get their Smart Serve, which enables them to tend bar for themselves and others. For those that don’t have Smart Serve, there is always a fellow member who springs up from their table to satiate your libation privation. It is a throwback to a simpler time, while staying in the good books of the local liquor inspector. It’s homey, collegial and importantly saves the club the cost and challenges of employing a part-time bartender.